The Holy Apostle James, the son of Zebedee, was the brother of Saint John the Theologian, and one of the Twelve Apostles. He and his brother, Saint John, were called to be Apostles by our Lord Jesus Christ, Who called them the “Sons of Thunder” (Mark 3:17). It was this James, with John and Peter, who witnessed the Raising of the Daughter of Jairus, the Lord’s Transfiguration on Mount Tabor, and His agony in the Garden of Gethsemane. Saint James, after the Descent of the Holy Spirit, preached in Spain and in other lands, and then he returned to Jerusalem. He openly and boldly preached Jesus Christ as the Savior of the world, and he denounced the Pharisees and the Scribes with the words of Holy Scripture, reproaching them for their malice of heart and unbelief. The Jews could not prevail against Saint James, and so they hired the sorcerer Hermogenes to dispute with the apostle and refute his arguments that Christ was the promised Messiah Who had come into the world. The sorcerer sent to the apostle his pupil Philip, who was converted to belief in Christ. Then Hermogenes himself became persuaded of the power of God, he burned his books of magic, accepted holy Baptism and became a true follower of Christ. The Jews persuaded Herod Agrippa (40-44) to arrest the Apostle James and sentence him to death (Acts 12:1-2). Eusebius provides some of the details of the saint’s execution (CHURCH HISTORY II, 9). Saint James calmly heard the death sentence and continued to bear witness to Christ. 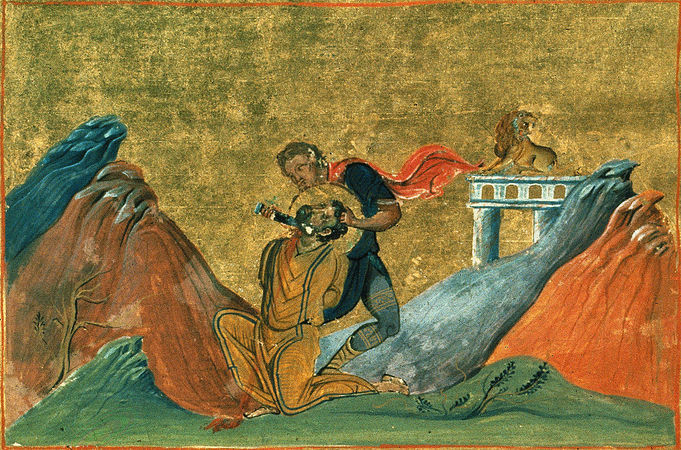 One of the false witnesses, whose name was Josiah, was struck by the courage of Saint James. He came to believe in Jesus Christ as the Messiah. When they led the apostle forth to execution, Josiah fell at his feet, repenting of his sin and asking forgiveness. The apostle embraced him, gave him a kiss and said, “Peace and forgiveness to you.” Then Josiah confessed his faith in Christ before everyone, and he was beheaded with Saint James in the year 44 at Jerusalem. Saint James was the first of the Apostles to die as a martyr.